Today the financial services market is experiencing unprecedented transformation. Restructuring, consolidation and volatility are driving significant structural changes in the investment and retail banking sectors. Banks are responding by actively looking for ways to improve liquidity, restore investor confidence, increase customer retention and better compete for deposits. They recognize the need to streamline business processes to better support their clients during account opening, loan origination, mortgage processing and portfolio management. 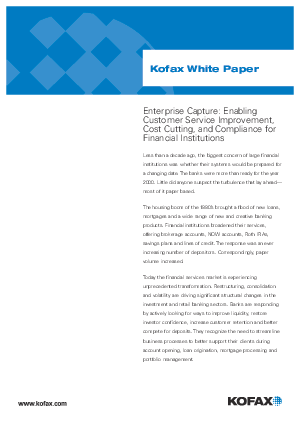 Banks and other financial institutions have responded to this avalanche of paper by deploying a number of back office document capture systems, usually at a central office or remote document processing facility. Meanwhile, looking to reduce their own paper backlogs, the local branches of these same financial institutions have made separate investments to automate their document driven business processes. The benefits brought by automated document capture are numerous. Business processes are more efficient in an electronic data environment. Customer accounts can be opened faster, and loans approved more quickly. Transactions can be handled more accurately, and information shared across departments more quickly. By automating the repetitive tasks of document handling, data entry and validation, banks can significantly reduce labor, risk and storage costs. In the high volume document processes of financial institutions, these efficiencies translate to substantial cost savings.